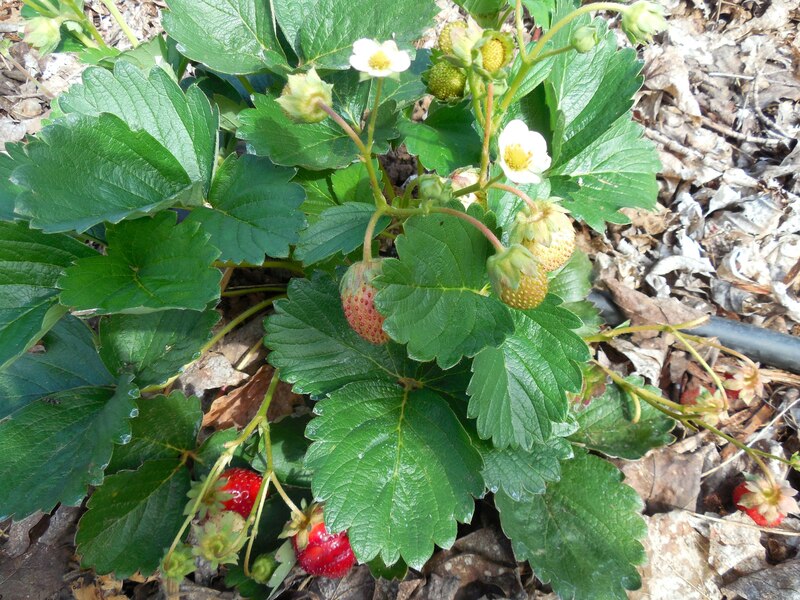 Strawberry plants are looking great. I pick a couple of pints every morning. My favorite ways to eat these summer gems is on a bowl of granola for breakfast, and on a dinner salad. M-m-m, tasty! Any extras get frozen on a cookie sheet and put away to be enjoyed in winter. 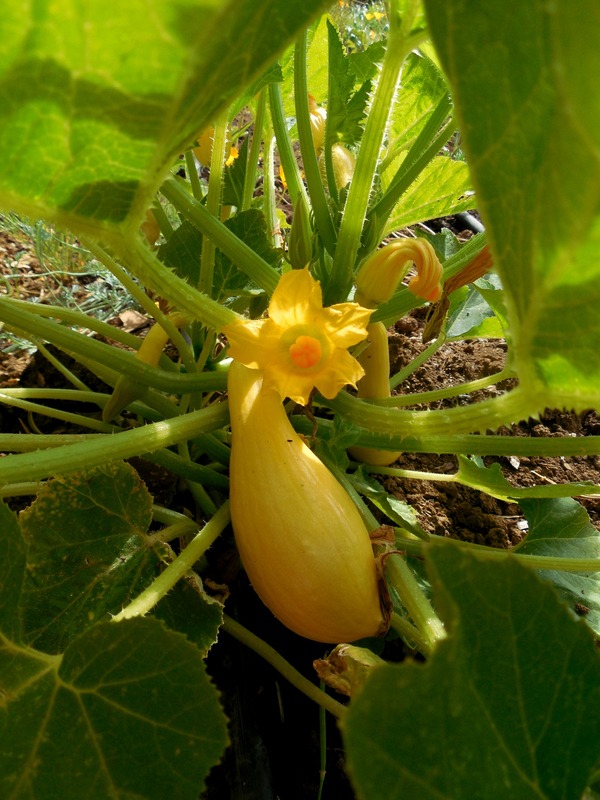 Summer squash is just getting going, I like mine small, young & tender. 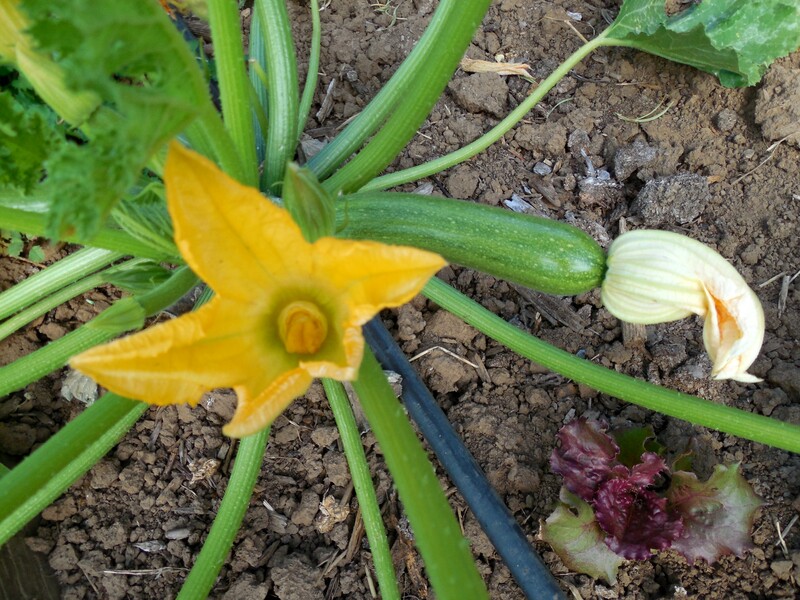 A friend was surprised with a few zucchini at her front door the other morning. The zuke elves are starting their rounds, watch out! 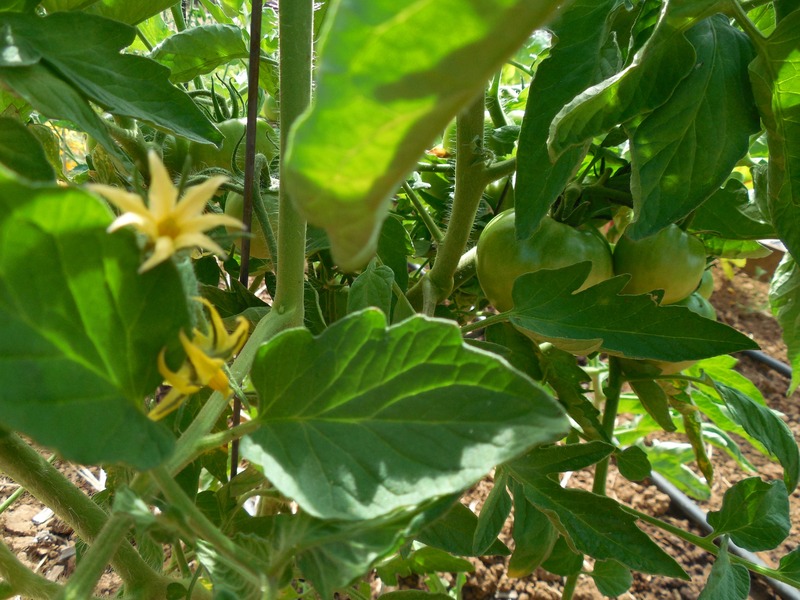 I’ve picked only a very few cherry-size tomatoes, and not one green bean – yet. The best is yet to come in these departments. Baby, red leaf, butter lettuce gone to seed is not necessarily glamorous. The dandelion-looking fuzz balls are their flowers gone-to-seed. Close-up the flowers are kind of cute. I try to keep flowers pinched from all my basil plants, as it is the leaves that are used. 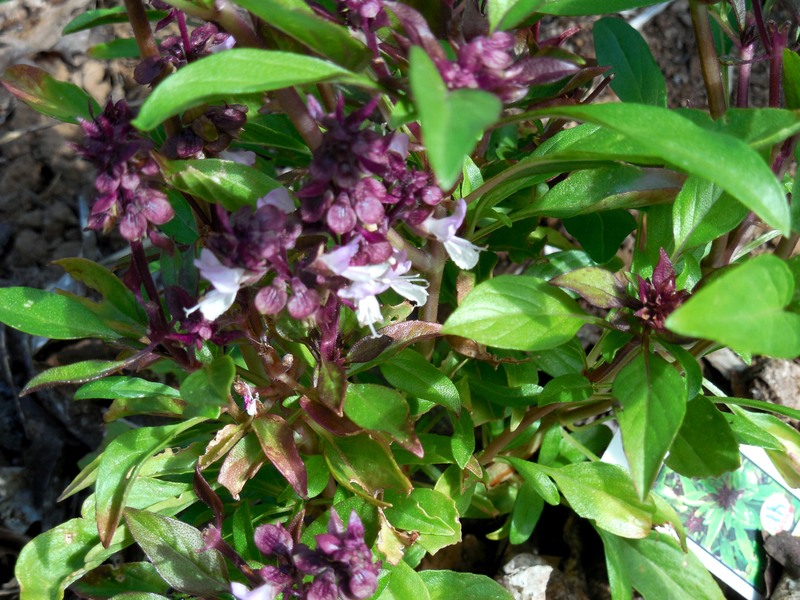 Thai basil has the prettiest purple flower buds, and a few blossoms opened before they were pruned. These leaves get dried to add flavor to curry dinners all winter long. 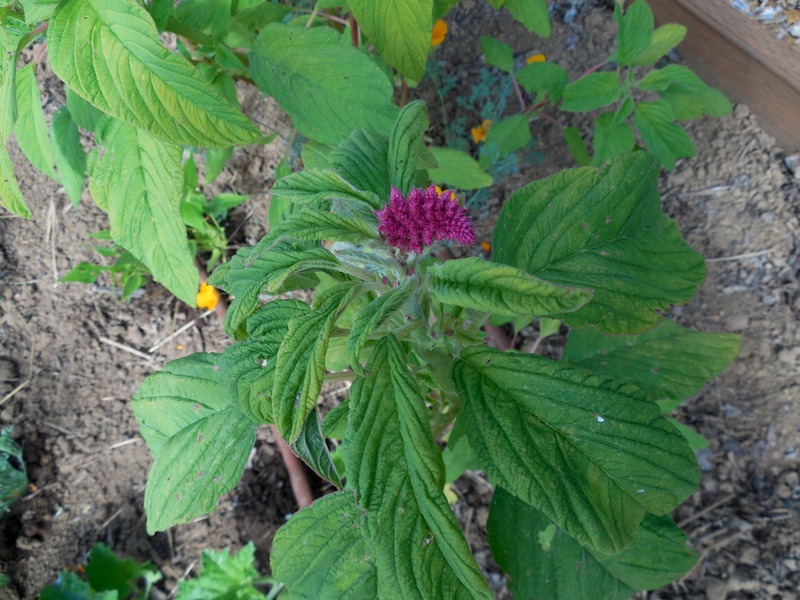 Amaranth is new to me, and I’m not sure how much larger the flower will grow. 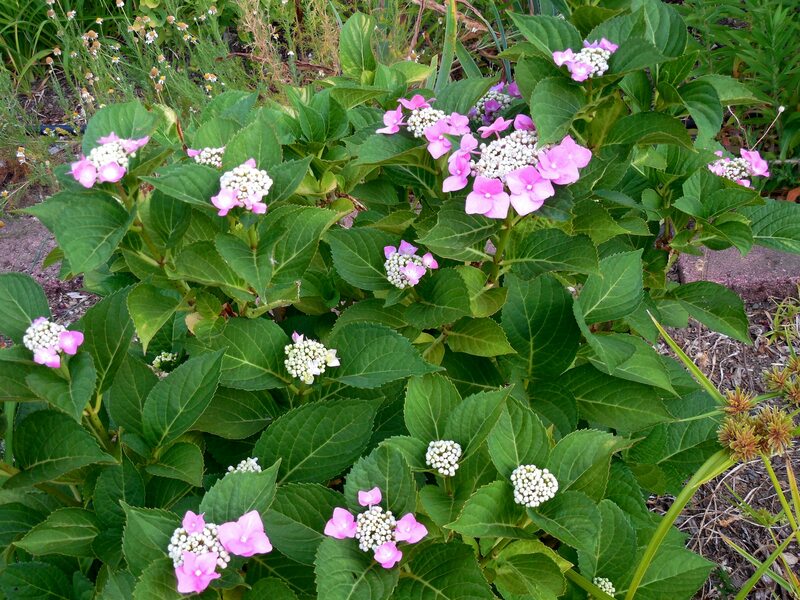 There are around a dozen plants, each about a yard (a meter) tall. I keep checking this one, there is much for me to learn here. Melons are such a gamble to harvest here. Will the heat continue through August and September? Since it is still July, it looks like this could be a good year. 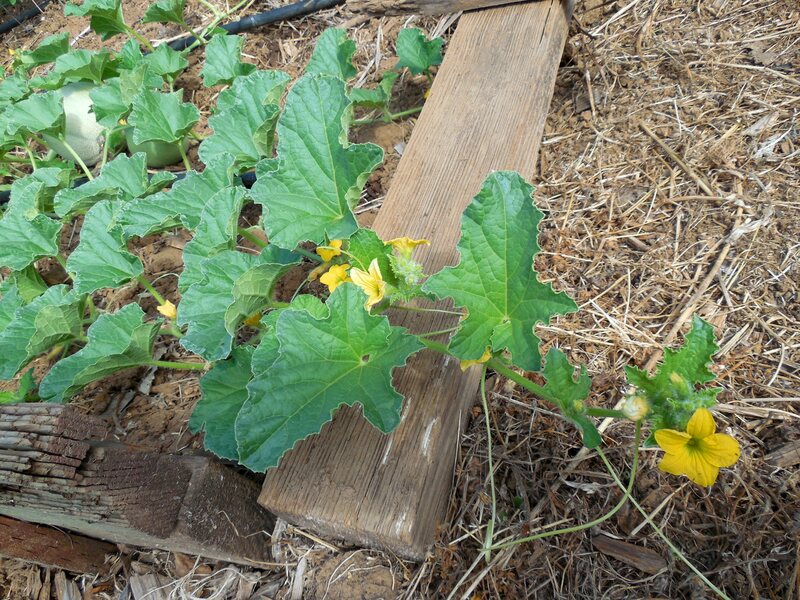 Cantaloupe or rockmelon are the size of a large orange, so far. 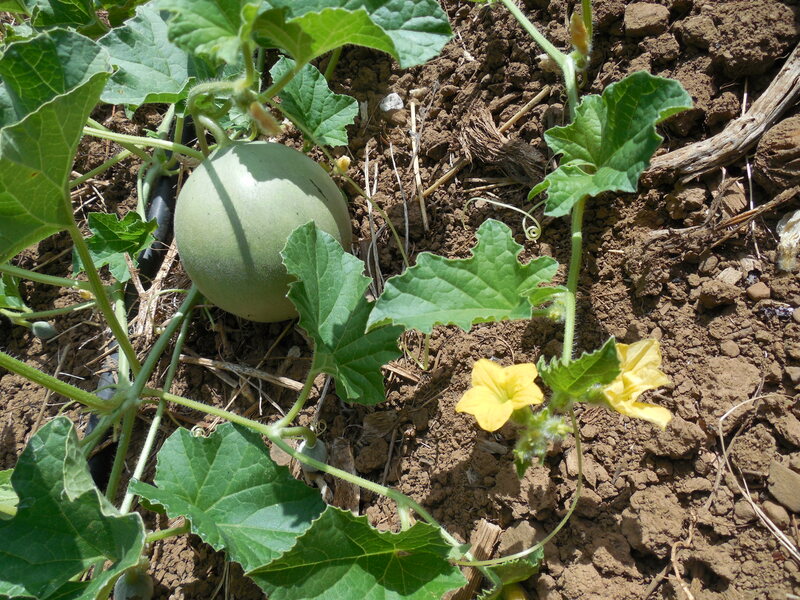 Smooth-skin melons usually take longer to mature, but this one is on its way, also. 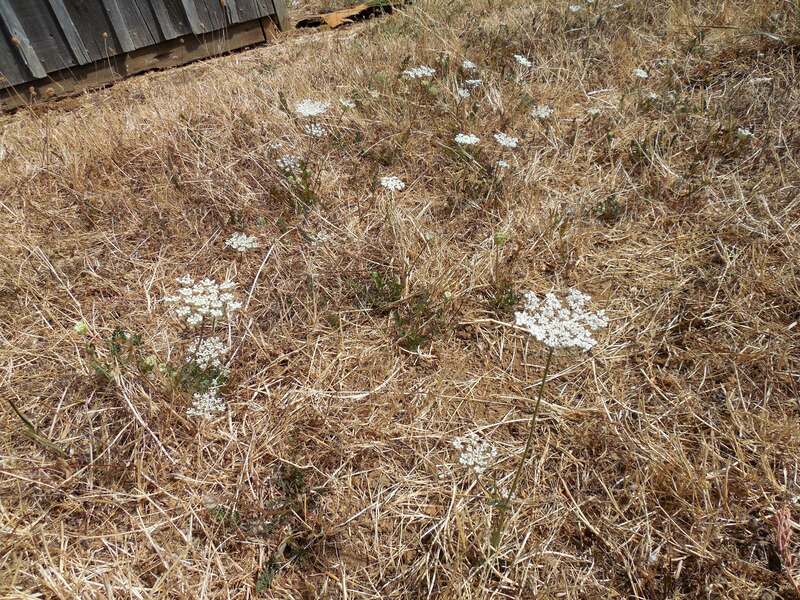 Someone was just here extolling the beauty of Queen Anne’s lace in the fields, and I objected. The flowers are not evil themselves, but when they go to seed, the trouble starts. It is a test of my patience to pick the burrs out of kids and my own socks. 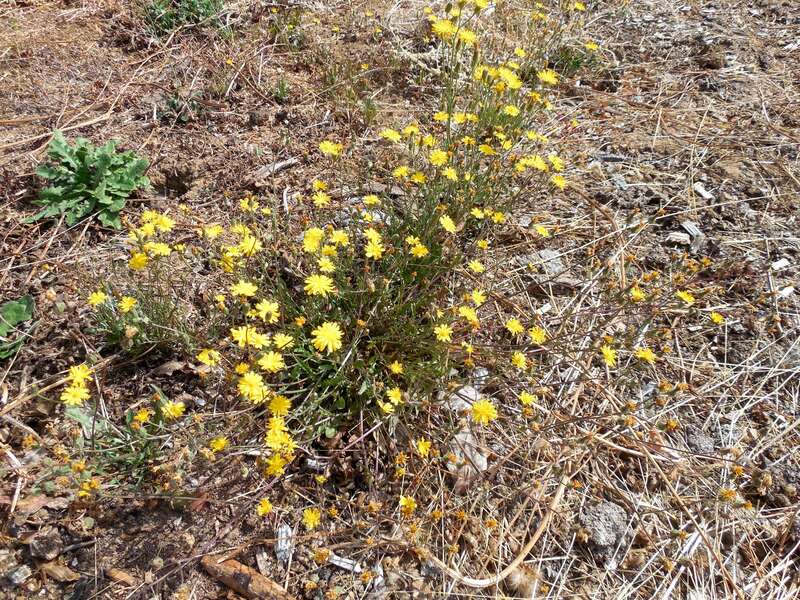 The yellow flowers are not dandelions, but I would not be surprised to learn they are close cousins, as the flowers turn to fuzz-balls when they go to seed. 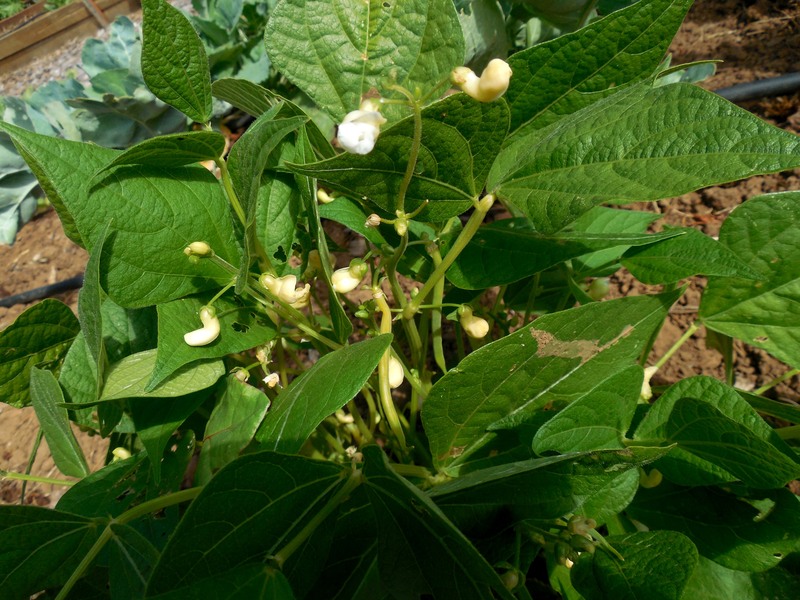 Categories: Uncategorized | Tags: amaranth, basil, blossom, butter, cantaloupe, crookneck, dandelion, flower, French, garden, green bean, lettuce, melon, prune, Queen Anne's Lace, red leaf, rockmelon, squash, strawberry, Thai, tomato, vegetable, yellow, zucchini | Permalink. 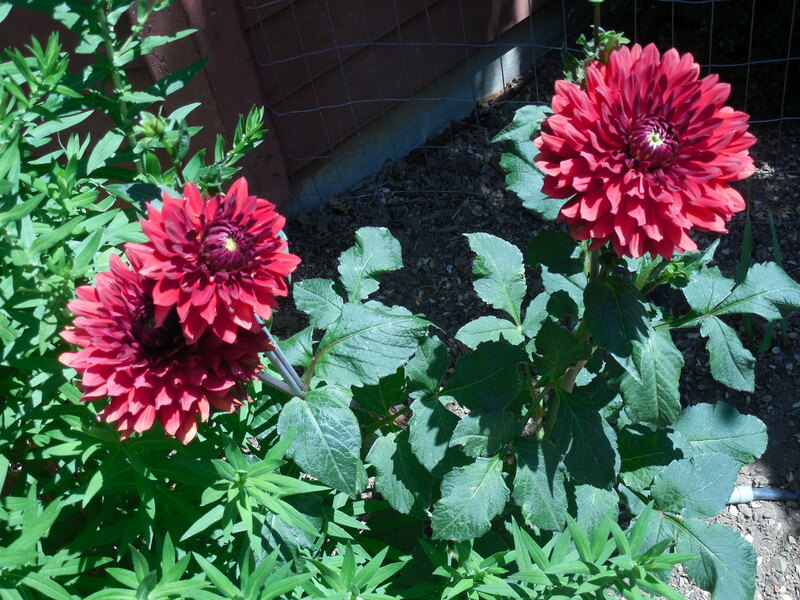 Four dahlia bulbs were planted a couple of years ago. I see three coming up, but only this one is blooming. 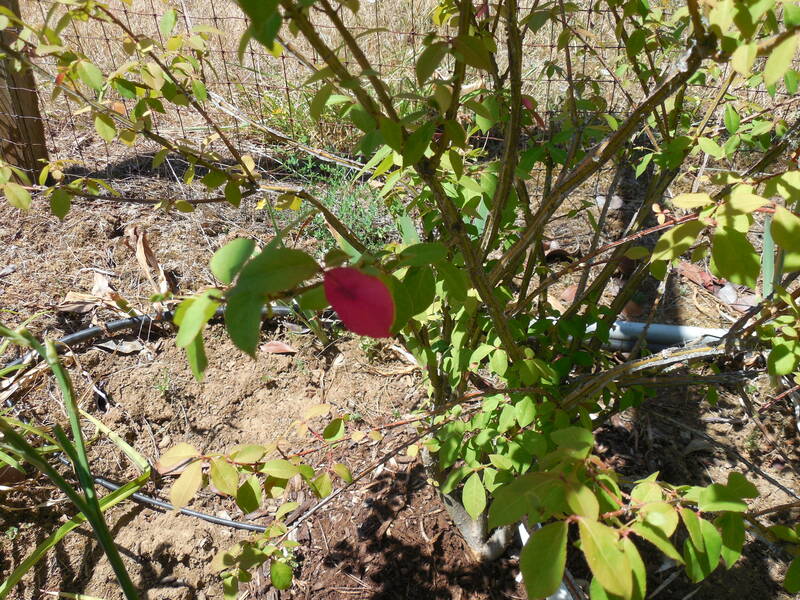 One has buds, and is also in direct sunshine, but no flowers yet. Why, oh, why? 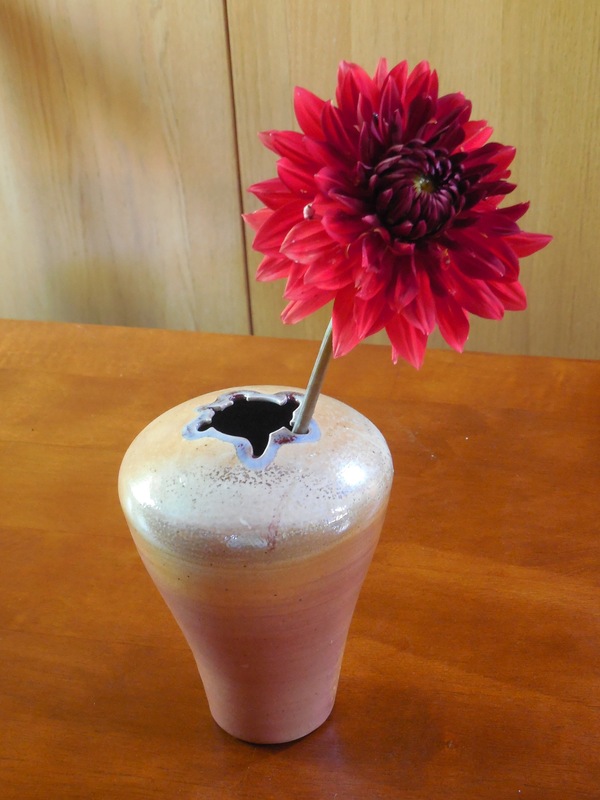 Dahlia poses in my version of a bud vase. 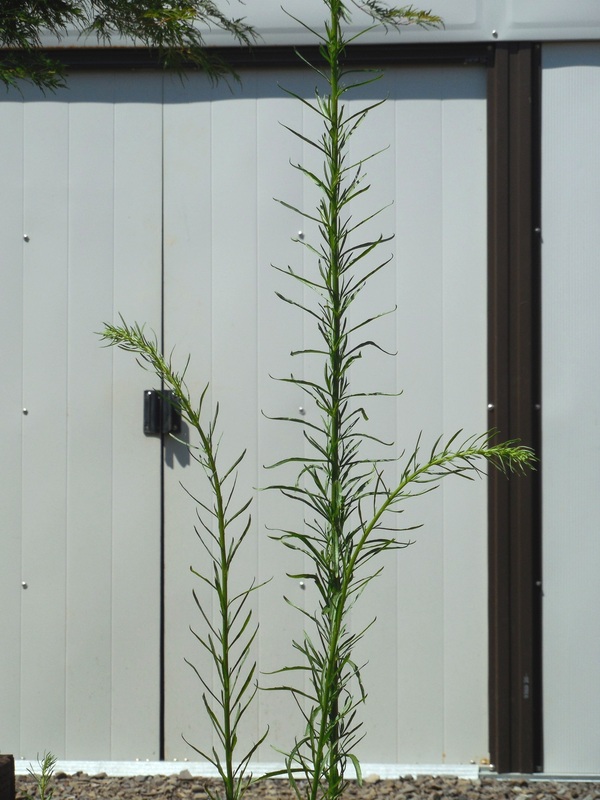 The turtle cut-out on top helps the single flower stem stay erect. This is what the flowers from the top photo look like a week later. It is tough to age gracefully, but these are doing pretty good. Categories: Uncategorized | Tags: age gracefully, dahlia, flower, turtle, vase | Permalink. 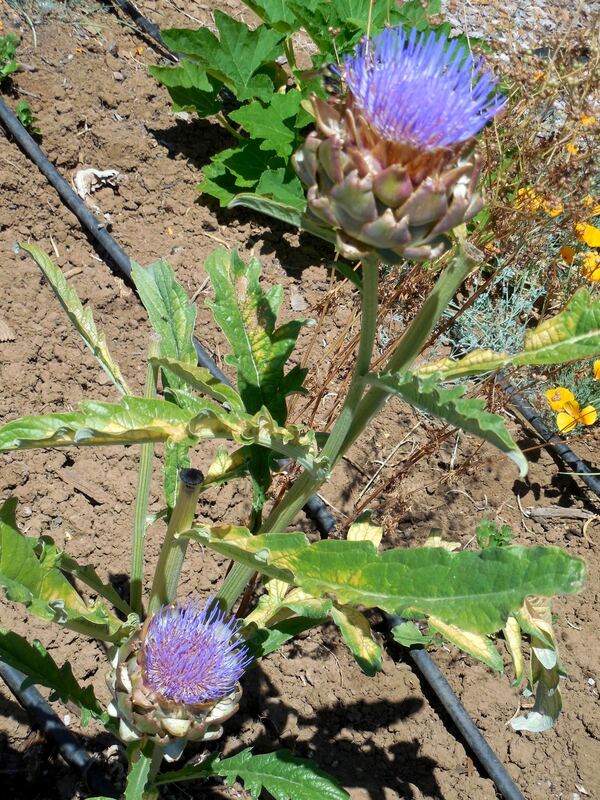 After our share of thistle hearts (in case you didn’t already know, artichokes are in the thistle family), I let the last few buds go to flower. This was not the only bee allowed a last fling before I cut the flowers. 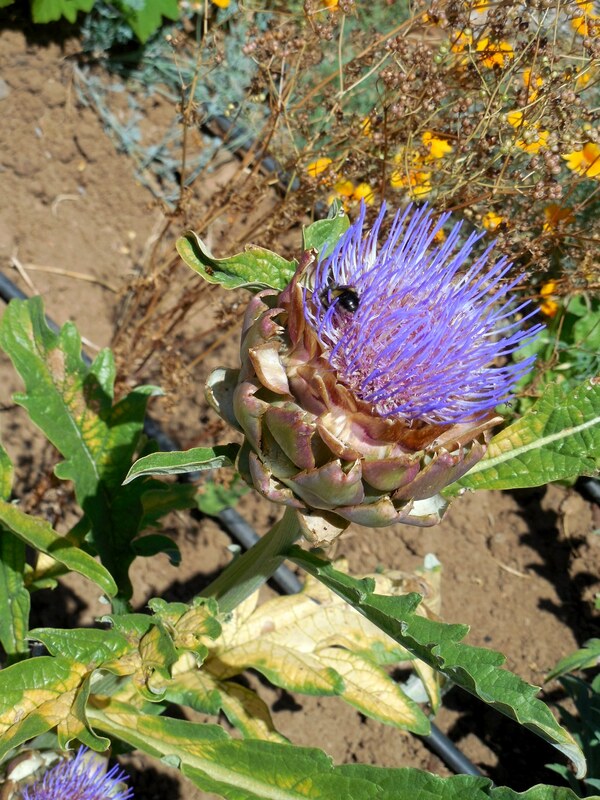 If you get a chance to feel them, fresh artichoke flower tops are very soft. 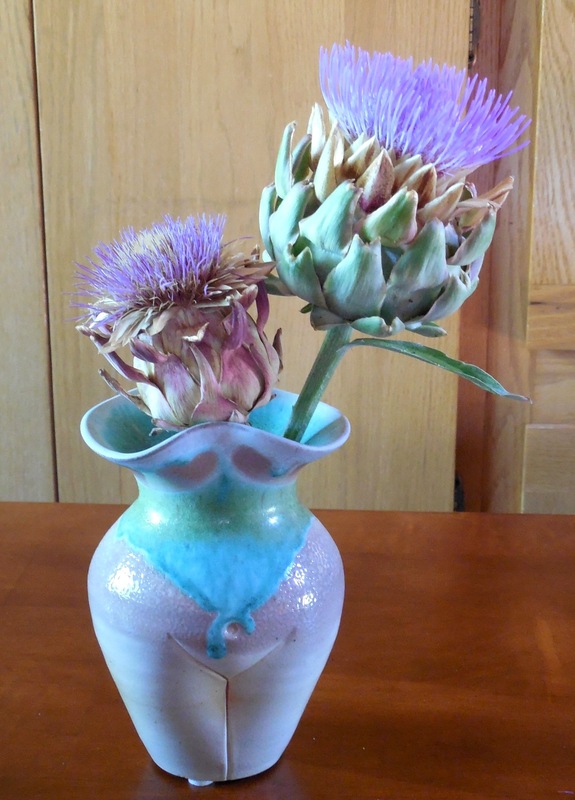 A dried artichoke flower from last year is on the left and a fresh cut flower on the right. Not only the color of the new flower base (it is green), but its shape reveal the difference in age of the two. As water evaporates, the bud will shrink and lose weight quite a bit. These flowers are standing in a Goddess Vase that I made. 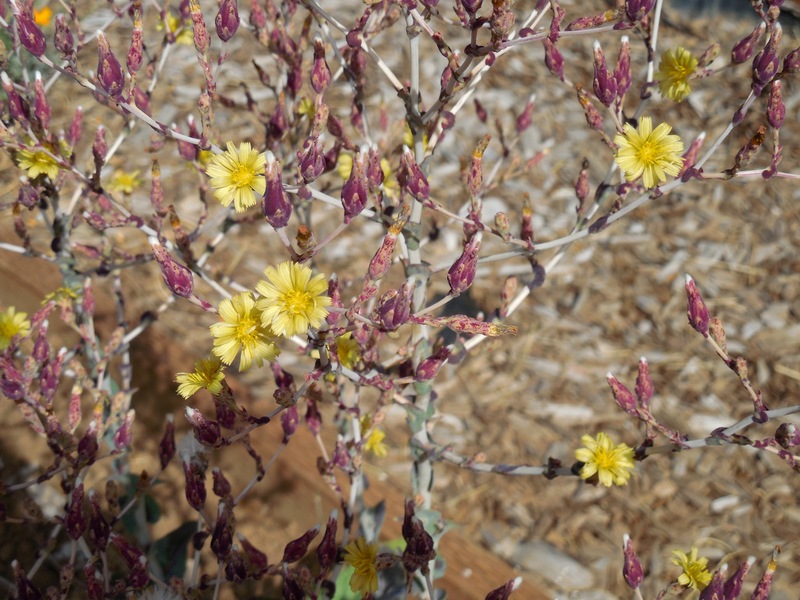 I love to play/work in the mud – clay and flowers both live in dirt. One of the coolest things about artichokes, is that the mother plant that yielded delicious eating chokes and pretty flowers for drying, makes baby plants before it dies. 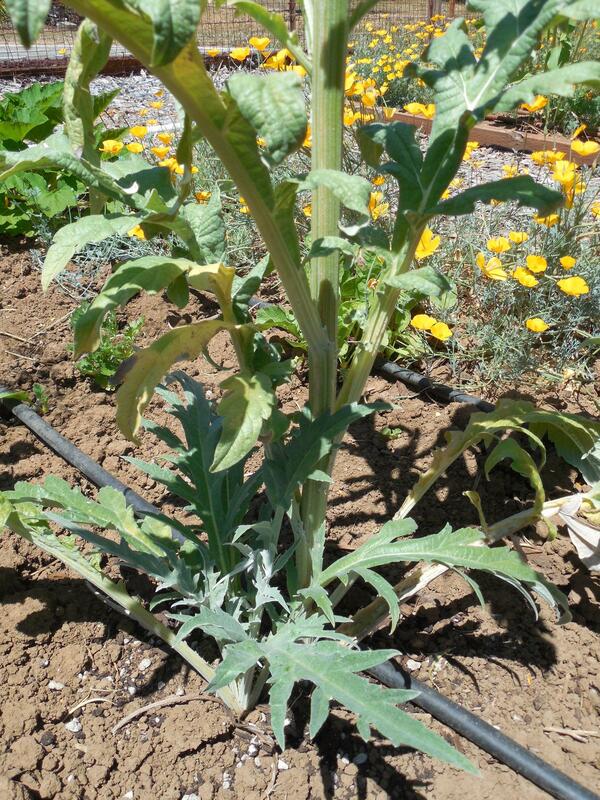 There are two artichoke plants coming from the ground, in the photo above. On the left side is new growth with the mother plant’s leaves turning yellow on the right side. Categories: Uncategorized | Tags: artichoke, baby, choke, delicious, dried, flower, goddess, mother, plant, potter, thistle, vase | Permalink. Just this one time, Veronica! Summer is not the usual season to transplant. Especially when it is a particularly hot summer (global warming? ), on a hot afternoon. 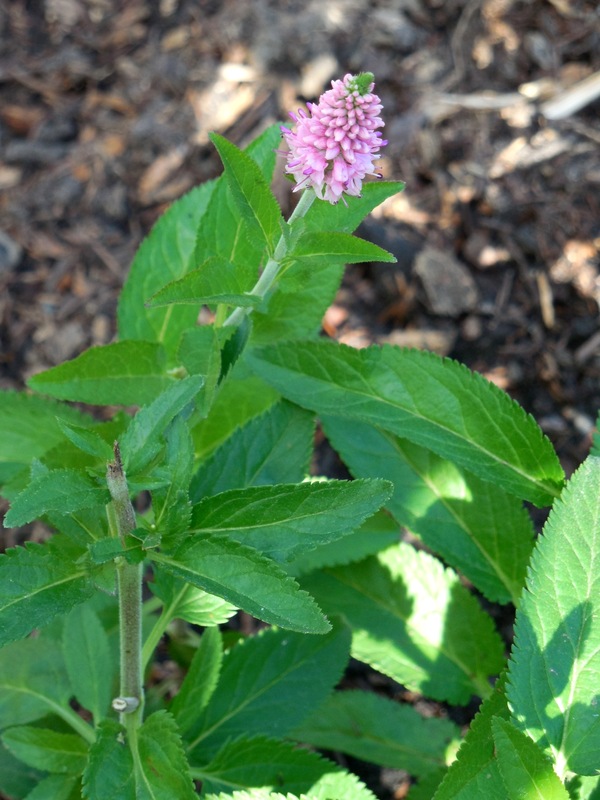 On a recent trip to my local Farmer’s Coop, I spied a desired perennial – on sale! 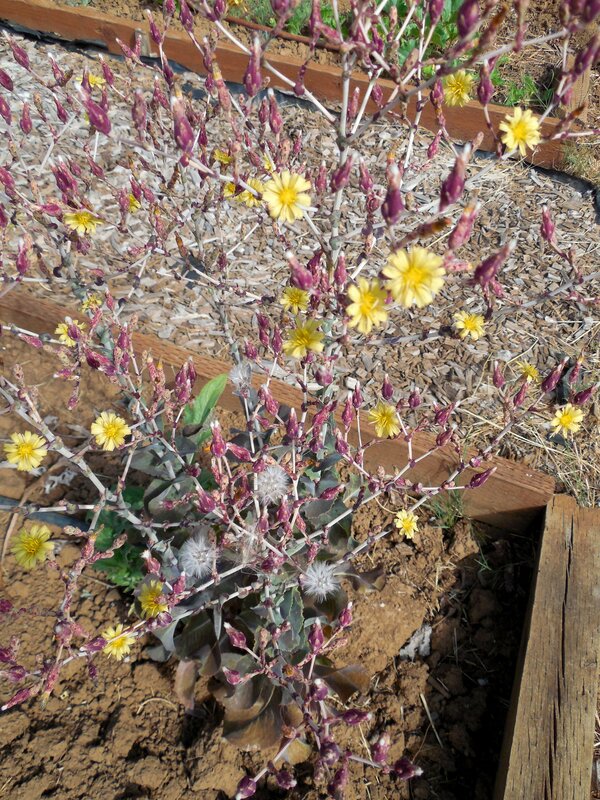 It was in great condition (okay, just a little root-bound), had blooms, and I had recently noticed a location in my flower garden that could use a plant just like this. Another blossom fell off on the drive home, so I immediately put it in a vase. Veronica is also an excellent cut flower, as it has been on my kitchen table for a week. Welcome to your new home, Veronica! Categories: Uncategorized | Tags: global warming, perennial, rootbound, summer, transplant | Permalink. When I was younger, I thought I knew a lot (sometimes I even thought I knew it all!). Everyday, as I get older, I realize just how little I know. Does this make me smart ? Because I know that I have lots to learn. Or does this make me stupid, because I am dumb enough to think I know anything? 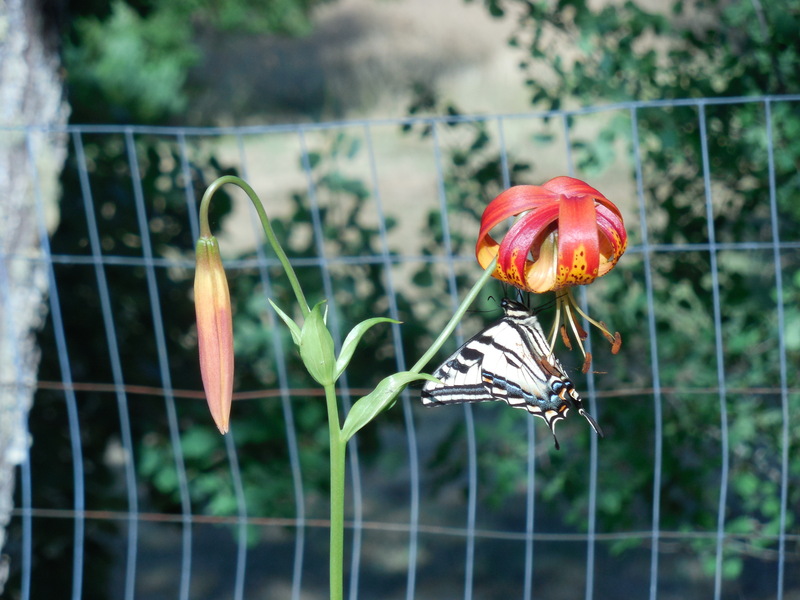 I posted this photo on June 29, 2015, and claimed it was a Monarch butterfly with a lily. WRONG! Monarchs are orange and black, what is in the photo is a Swallowtail butterfly dining on an Asiatic Species Lily. Can you tell that the leaves look the same? 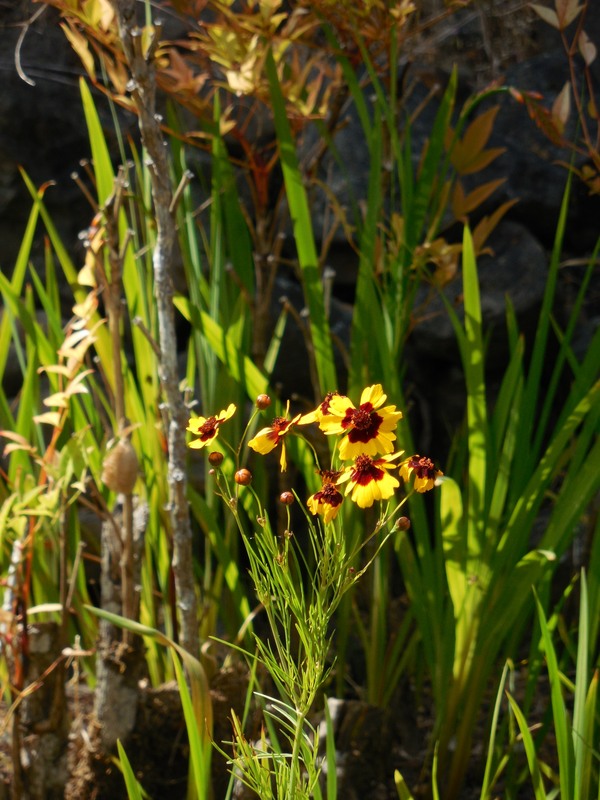 The specimen on the right has significantly more altitude than the shorter flower. 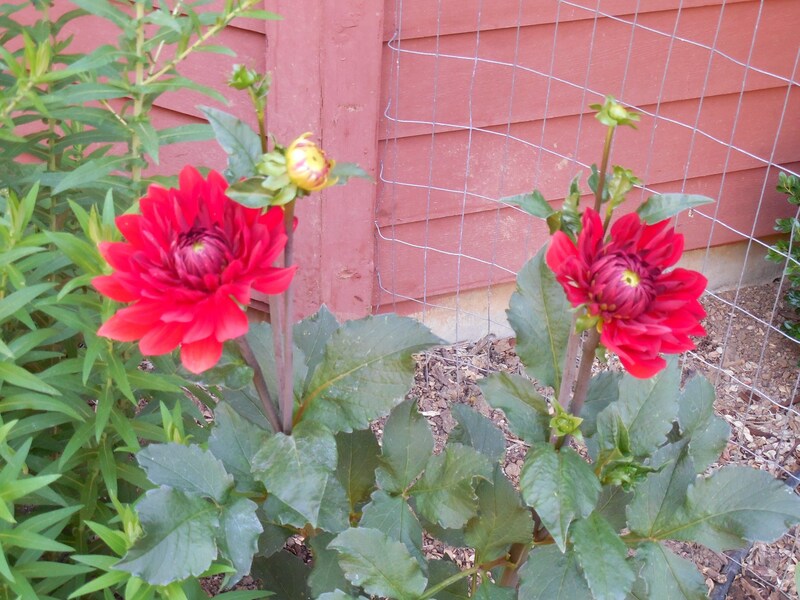 I am waiting for the taller one to bloom before the deer discover it and chew the buds off. Categories: Uncategorized | Tags: Asiatic, butterfly, coreopsis, lily, monarch, species, swallowtail, weed | Permalink.